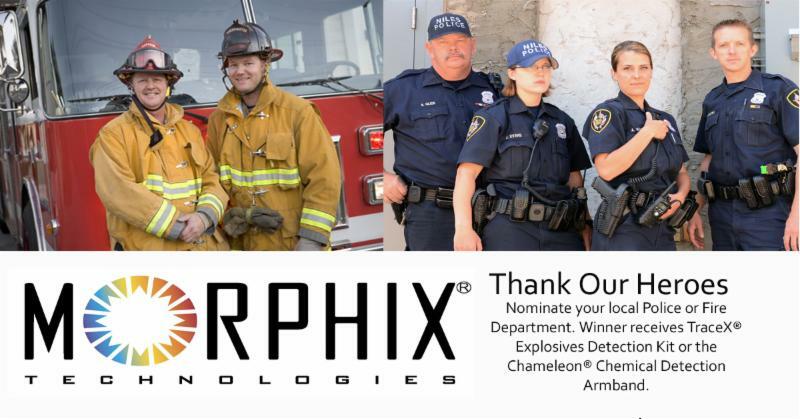 Morphix Technologies® is accepting nominations from Aug. 15 – Sept. 15, 2018 of worthy agencies in need of chemical or explosive detection devices. One lucky winner will receive a product donation. Virginia Beach, Va. (August 2018) –Morphix Technologies®, an innovator in the science of detection devices for dangerous chemicals, has announced an exciting new initiative where it is soliciting the public for nominations of worthy law enforcement agencies or fire departments who may be in need of life saving chemical or explosive detection products. Upon reviewing the submissions, one agency in need will be determined to receive a product donation from Morphix Technologies of either its TraceX® Explosive Detection Kit or its Chameleon® Chemical Detection Armband. Morphix Technologies will be accepting nominations from Aug. 15, 2018 through Sept. 15, 2018. The winner will be contacted on Sept. 21, 2018. Submissions must be emailed to ashley@lauraburgess.com. The full contest rules can be read here: http://ow.ly/bANE30loTED. Submissions must include a brief essay (300 words or less) or a video (two minutes or less) about the law enforcement agency or fire department that they are nominating and why they deserve the donation. Submissions should also include the nominators name, address, contact information and relation to the agency, as well as the agency information, address, website address and contact information. The winning submission becomes the property of Morphix Technologies to use as part of its public relations and social media efforts. “There are so many wonderful, hardworking law enforcement agencies and fire departments out there that are working on diminishing budgets and aging equipment. These brave men and women put their lives on the line daily to protect us citizens and we wanted to honor what they do by donating some of our products to an agency that is truly in need. We’re asking the public to help us determine who should receive this donation by nominating an agency or department they think deserves to be recognized,” commented Kimberly Pricenski, vice president of sales and marketing for Morphix Technologies. The TraceX Explosive Detection Kit is an affordable and easy-to-use product that aids in the detection of major explosive material threats and their precursors in a single test without exposing the kit to contamination or the user to dangerous chemicals. It was developed by Morphix Technologies under contract from the U.S. Department of Defense and meets their demanding requirements. It is small enough to fit in a cargo pocket, lightweight and rugged. Each kit comes in its own disposable protective plastic case, so the handler will be ready to use it when needed and is shelf stable for 24 months. 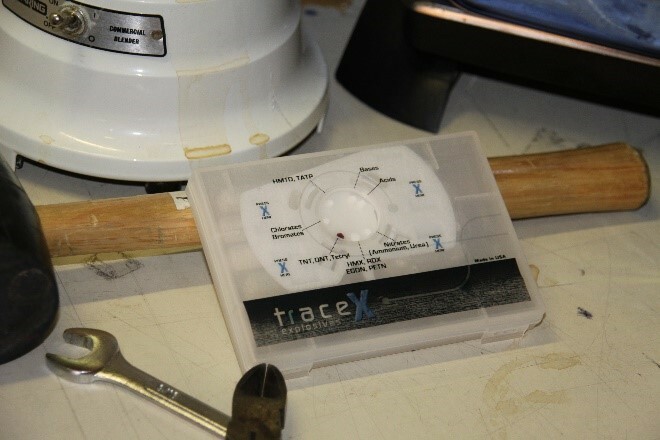 With a single swab, the TraceX Explosive Detection Kit detects all the major families of explosive materials and their precursors. The Chameleon Chemical Detection Armband is an easy-to-use, inexpensive, wearable, reusable armband that can hold up to 10 cassettes, each of which detects a particular toxic chemical and changes color upon detection. One color indicates the absence of toxic gas. When two colors appear in the window, the user knows it is time to take action. Designed for use in the arctic, tropical and desert conditions, the Chameleon Chemical Detection Armband can even be immersed in water. Morphix Technologies has prioritized its product development based on the advice of the U.S. military and law enforcement agencies, so the Chameleon Chemical Detection Armband cassettes are available for many of the high-risk Toxic Industrial Chemicals (TICs) identified by the U.S. government. It has also been approved by the U.S. SAFETY Act of the Department of Homeland Security as an anti-terrorist technology. If you’d like to receive more information on the Chameleon or TraceX, please contact Morphix Technologies toll-free at 800-808-2234 or locally at 757-431-2260. You can also email sales@morphtec.com. This entry was posted in CBRN and tagged Morphix Technologies. Bookmark the permalink.